Restores 100% white items stained by colour runs. 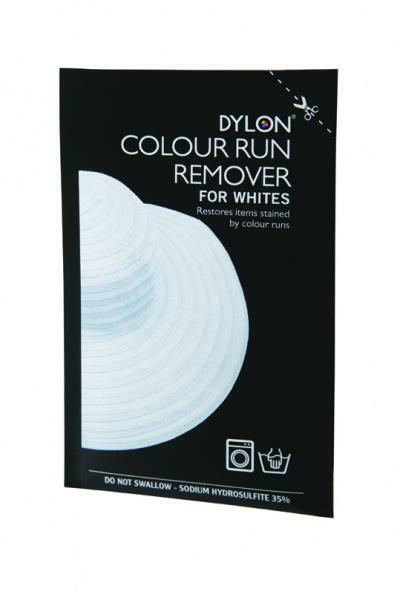 Dylon colour Run Remover removes colour runs to restore whites to brilliant perfection, so now you can reclaim your pristine whites and wave goodbye to colour run stains for good! One sachet is sufficient to treat up to 500grams of fabric (e.g. 2 shirts) and is suitable for all washable fabrics including wool & silk. For use on 100% whites only. The non-chlorinebleach formula will not damage or yellow fabrics and it’s safe for use on white T-shirt s with printed logos or images.